Finally, June 27th sees the debut of the lush and contemplative CHILDREN OF THE SEA. Updates to 22 other popular VIZ Media digital manga series are also scheduled. The Viz Manga App is now available for free for the iPad, iPhone and iPod Touch devices through the iTunes Store and all manga volumes are generally available for purchase and download in the U.S. and Canada. AI ORE! takes readers on a rollicking rock-and-roll ride in this new series by Mayu Shinjo, the creator of SENSUAL PHRASE. Mizuki is the female “prince” of her all-girls school and the lead guitarist in an all-girl rock band. Akira is the male “princess” of his all-boys school and wants to join her band. Love may be on his mind, but romance is difficult when everyone keeps mistaking Mizuki for a boy and Akira for a girl! BACKSTAGE PRINCE, Vol. 1 · Rated “T” for Teens · Available Now! Set against the vivid backdrop of Kabuki theatre, Kanoko Sakurakoji’s BACKSTAGE PRINCE introduces readers to Akari, who is totally clueless about kabuki – and boys – but is eager to learn about both. Her first encounter with Ryusei doesn’t go very well, but with the help of a cat named Mr. Ken, the two teenagers quickly become the prince AND princess of kabuki. Love was never so dramatic! 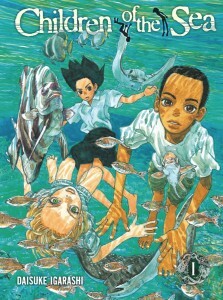 Daisuke Igarashi’s riveting manga series CHILDREN OF THE SEA is an intriguing aquatic adventure that also delivers a strong message about preserving the world’s oceans. When Ruka was younger, she saw a ghost in the water at the aquarium where her dad works. Now she feels drawn toward the aquarium and the two mysterious boys she meets there, Umi and Sora. They were raised by dugongs and hear the same strange calls from the sea as she does. Ruka’s dad and the other adults who work at the aquarium are only distantly aware of what the children are experiencing as they get caught up in the mystery of the worldwide disappearance of the oceans’ fish. THE STORY OF SAIUNKOKU, Vol. 1 · Rated “T” for Teens · Available Now!